So, the first thing I do when I write an Eclipse-based application, or any application for that matter is set a quick baseline of what I want done. For my first milestone, I decided I simply wanted to be able to log into Facebook. I figured, this would be a good start… it would require me to use the Facebook API in some fashion. This would force me to create a plug-in for the Facebook API which I would reuse when I started to do things like update my status from Eclipse. So my first stop was to look at the Facebook Java APIs since that would make life easier for me. I found a cool project hosted at Google Code that contained some Java APIs. The only problem was that it seemed you needed a million jars to use these APIs. As an Eclipse plug-in afficiandio, I knew how to handle this… I’ll create a new plug-in! 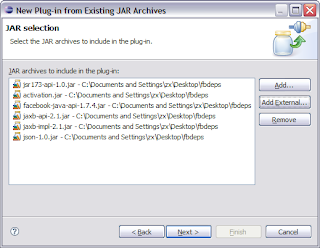 I downloaded all the jars and then launched the ‘New Plug-in Project from Exisiting Jars’ wizard which allows me to quickly create a plug-in by pointing to those existing jars. 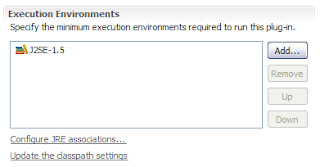 BREEs are a way of telling Eclipse and OSGi that your plug-in at a minimum, requires Java 5.0 to run. This is cool because the Eclipse runtime won’t activate your plug-in if it’s running on Java 1.4… only Java 5.0 and above. The runtime will also give a message out stating that the plug-in can’t activate because the mininum BREE hasn’t been yet… also cool! So with my new Facebook API plug-in setup and polished to my liking, we can go and start exercising that API in interesting ways. The first way will be finding a way to log-in to Facebook and that will be discussed in Part 2. Don’t forget to set BREEs, they can save your consumers some heartache! If you like this type of material, let me know. If there’s a good response, that’s usually motivation for me to do things faster.